This festive tomato and spinach cauliflower rice only takes 15 minutes to make and is a delicious low carb side dish. 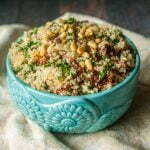 Cauliflower rice takes on the flavors sun dried tomatoes and garlic and is topped with crunchy pine nuts. Add oil to a large saute pan and heat to medium high. Add garlic and tomatoes and saute for 30 seconds and then add the cauliflower. Mix well cook for 5 minutes. Add the water and cover pan for 3 minutes. Take off lid and taste cauliflower to see if cooked to your liking. I like it a bit al dente. Add the spinach, mix well and take off the stove.